Explore Our Service Trips for High School Students! Our Service Trips for High School Students include Dominican Republic volunteer opportunities and Haiti volunteer opportunities. We have dynamic and meaningful itineraries abroad in which students volunteer and work side-by-side with locals, gaining valuable experience in service learning while also crossing cultures. All of our travel programs include Fair Trade wages as a core value of our learning opportunities. Some groups like to offer community service at home and abroad. 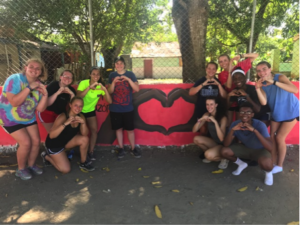 One school from Montgomery County, PA, for instance, had requisite volunteer hours at the local soup kitchen, then participated in an an international program in which they helped run a summer camp in the Dominican Republic. Our service trips for high school students are offered during both the summer and school year. We believe that international travel is most meaningful in programs that focus on learning from the culture we are partnering with. We do that by focusing on community service anchored in locally-identified needs. Read more to learn about how you and your group can get the experience of a lifetime! Sustainability is at the key of what we do. Students from PA, NJ, and beyond are learning what ethical travel for sustainability looks like. As much as possible, we stay in locally owned hotels and eat in locally owned restaurants so that the money we spend there, stays there (particularly in the Dominican Republic). In Haiti, it is more difficult to find a locally owned hotel that meets our safety standards, and we put safety first. We hire locally owned transportation companies known for their stellar record. Community service opportunities are service learning programs that focus on educational and/or environmental sustainability. Examples of our programs include students teaching English, running summer camps, teaching sports, painting, performing light construction, planting food for sustainability, and other groups from PA, NJ, and beyond doing much more. Your green thumb may get a lot of practice at home, and we create opportunities for you to use those skills abroad. We offer a wide array of international opportunities, which some describe as non-religious mission trips. Our volunteer travel programs are designed to support local goals while also changing your group for the better in what they learn from an international, local partnership. “The best week of my life,” is exactly how a former high school student describes her experiences on our Dominican Republic program. Students learn a great deal from their service, and many – perhaps most – will never look at the world the same way again. We also find time for fun. When possible, we make room for evening time at the pool or beach. Some trips will have an excursion day to a beautiful beach or sandbar. Sometimes, students can also sign up for surfing lessons or zip lining. Are you bringing a lot of players from a sports team? We can have international soccer games in Haiti or international basketball or baseball games in the Dominican Republic. Our Service Trips for High School Students emphasize service, but we create time for fun and recreation as well. What is Included in a Service Trip? When a teacher leads a program, the teacher and chaperones travel for free. We can also support teachers from various schools traveling together to help the trip you’re running if you are coming with a smaller group. For example, we have combined groups from PA and Minnesota as well as PA and Michigan, due to one group being too small to run on its own. Our Service Trips for High School Students include airfare, lodging, meals, transportation within the country, and a full-time local Field Director and local bus driver who stays with our group. The Field Director and bus driver stay with us full-time and are at the the group’s disposal in the event of an emergency, while also bringing a local understanding to integrate into the fabric of your trip. Our Service Trips for High School Students are available for schools from Bucks County, Burlington County, Chester County, Union County, Essex County, Montgomery County, Warren County, and other schools in PA, NJ, and beyond.